The Flags of all Nations chart [man36] shows a light blue flag with the National flag as a canton, with the Saudi roundel for the Air Force. The current version has a smaller canton. The roundel is (from outside) green-white-green and shows the emblem (white palm over two white crossed swords) in the central green panel. The fin flash is the national flag. This can be seen on a photograph of a Hawk jet trainer from Jane's Defence Weekly . However, the shahada and sword are filling the field much more than on the flag as we show it. 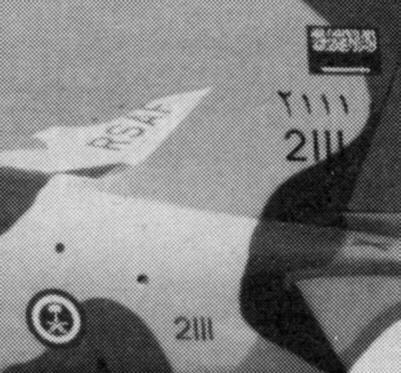 A silly mistake can be found on the decal sheet for a scale model of the Lightning figther aircraft  that was also used by the Saudi air force. For the one side the decals show a (more or less) correct Saudi flag, for the other side, however, the whole thing mirrored, so that the writing can't be read. Tamiya 1/100 scale model kit of B.A.C. Lightning F.Mk.6, about mid 1980ies. 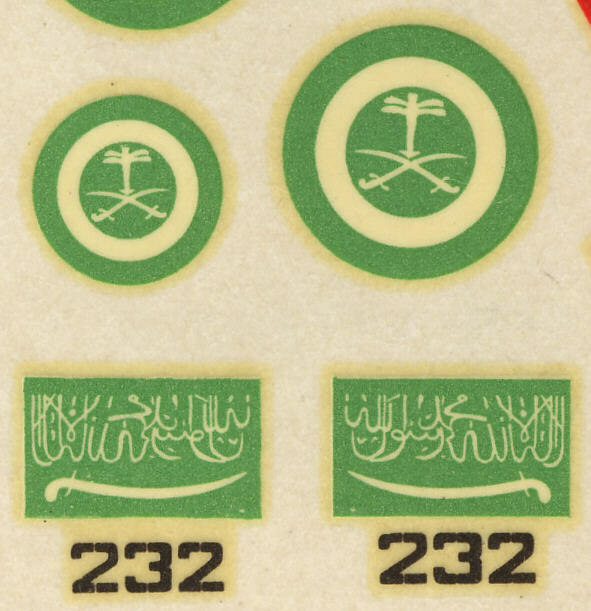 The Saudi Arabian Air Force uses a green-white-green roundel with the figures from the coat of arms in white in the centre.